In this series, we’re making an effort to get to know the enemies of food safety by taking a look at pathogens and potential hazards that cause foodborne illness in humans. Our last article was on listeria, and in this article, we’ll move onto one of the most notorious, and most common, causes of food poisoning, Salmonella. 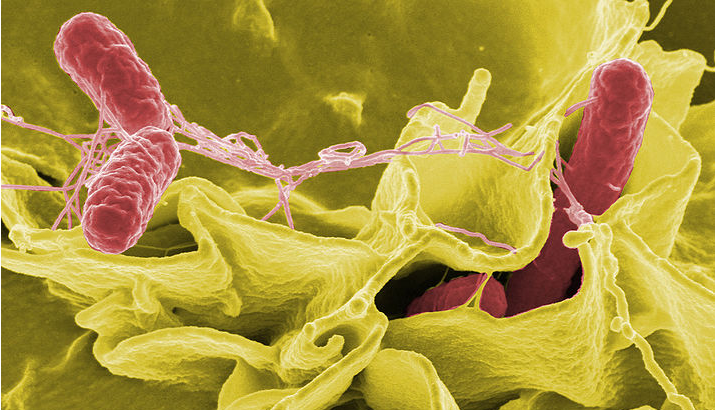 Salmonella is a genus of rod-shaped bacteria, with the main species of concern to humans being Salmonella enterica, which is found worldwide in all warm-blooded animals. Strains of Salmonella can cause a variety of nasty illnesses, most notably typhoid fever and food poisoning. Salmonella bacteria are part of the Enterobacteriaceae family, and they are primarily non-spore-forming, motile bacteria around 2 to 5 µm long. They can survive with or without oxygen and water, and through freezing, but they are killed by heat of 75°C after 10 minutes. The bacteria were first discovered in 1880 by Karl Eberth in typhoid patients, and 4 years later the pathogen was successfully grown in the laboratory by Georg Theodor Gaffky. The name Salmonella was after Daniel Elmer Salmon, a veterinary pathologist who ran the USDA’s microorganism research program in the 1800s. He had discovered Salmonella in pigs that had died of hog cholera, or classical swine fever. When a human becomes infected with Salmonella bacteria, it generally results in food poisoning. This usually occurs when humans ingest foods containing a high concentration of Salmonella, which then infects the body through the digestive tract. Adults can fight off quite a large number before infection, but infants and young children are much more susceptible. The infection can only take hold once living salmonellae reach the gastrointestinal tract. Some of the microorganisms are killed in the stomach, with gastric acid responsible for the majority, but some can still survive, embedding in the walls of the stomach and intestine, and sometimes oesophagus, and once these bacteria reach the end of their incubation period they release endotoxins, which cause enteritis and gastrointestinal disorder, or food poisoning. Typhoidal Salmonella is an even nastier form of the bacteria that has adapted to humans and some higher primates. This version is much better at making it through intestine walls and eventually infecting organs. Symptoms are similar at the start, but can worsen into shock, whether hypovolemic, septic or both. Preceding symptoms, common to both types, are what most people associate with Salmonella and food poisoning. In most cases, they show up as diarrhoea, stomach cramps and sometimes vomiting and fever. Usually, it takes 12 to 72 hours for the symptoms to develop after swallowing an infectious dose of salmonella; they then typically last 4 to 7 days, with the majority of people recovering without treatment. Treatment, if necessary, consists of several options. The main concern is to stay well hydrated, as this is the major danger of Salmonella. Drink plenty of fluids to offset those lost due to diarrhoea or vomiting. Your doctor might recommend a rehydration solution, available from your pharmacist. Sometimes, serious cases may be treated with antibiotics, and you must be sure to finish the course if this is the case for you. Also make sure to stay at home until 48 hours after symptoms have stopped, as you can still be infectious during this period. But how can you avoid treatment entirely by preventing Salmonella infection? Well, the key to that is good hygiene and food preparation standards. Wash your hands before preparing and eating food, after handling raw food, after going to the toilet, after contact with pets, or after working in the garden. In terms of food preparation, keep cooked food away from raw food, and store raw foods below cooked in the fridge. Wash raw fruit & veg well before eating, and make sure that cooked food (especially meat) is cooked thoroughly. If you have a food thermometer, food should be cooked at temperatures of at least 75°C for 10 minutes. Salmonella has been causing a whole slew of problems throughout history, from food poisoning, to the much direr outbreaks of typhoid. 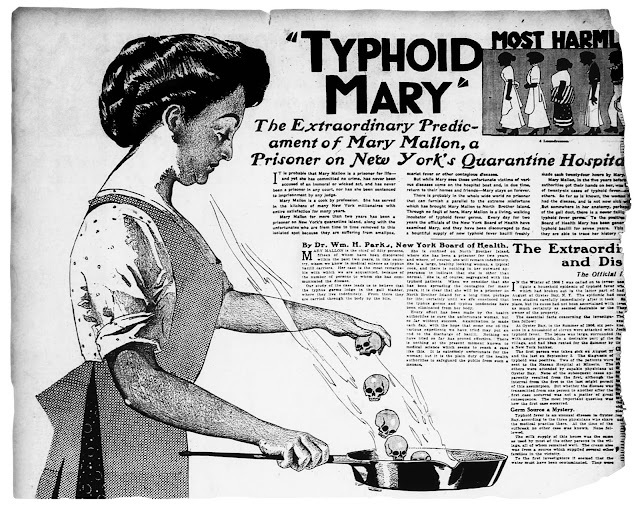 Perhaps the most infamous case of typhoid was that of Typhoid Mary, a private cook who was a healthy carrier of the disease, who then spread it to many people, causing the deaths of at least 3, and maybe more. However, the disease goes back way further than that, with one typhoid fever outbreak in 430 B.C. apparently wiping out one third of the population of Athens when the city was one of the most powerful in the world. Two of the worst Salmonella outbreaks in recent history are the 1985 Milk Farm Dairy outbreak, with 5295 infected and 9 deaths after a contaminated batch of 2% pasteurised milk, and the 2008 Peanut Corporation of America scandal, that led to 9 deaths and 691 people affected across 46 states after negligence from said company. It also led to imprisonment for senior executives of the firm, and one of the largest food recalls in American history, and was one of the worst food safety scandals of all time. Overall, Salmonella represents one of the most enduring and unpopular bugs in human history, with a nasty propensity to adapt and survive, and equally nasty effects on the human body. Thankfully, modern food safety techniques and standards have reduced infections, and modern medicine is much better at dealing with those ones that do make it through. Still, make sure you wash your hands!